Are you running a WordPress site that requires a secure user area with protected content? Do you have private content that only members of your association can access? Do you provide a fee-based business that has need-to-know documentation for your clients? WordPress doesn’t provide this feature by default, but it does provide user role access levels that can accommodate this, and with some simple template updates, you can cordon off your pages and posts as needed. This is sufficient for smaller sites, but let’s consider a more real-world, complicated example. Say you need to accommodate hundreds of users, with varying levels of access. We can also imagine that you have content that is only available for a limited time, or content that requires multiple levels of access rules (say, a salesperson with basic access and client-specific access rules), with each individual access level subject to specific time frames or other restrictive conditions. These special scenarios can be a pain when trying to limit access based on user roles. You need conditional rules with ever changing demands, time based access, or other complex access scenarios. Not to mention the dynamics of a typical business environment where things like user access could change on a dime, and you start to get the picture of how annoying maintaining a system like this manually would be. It’s a huge drain on resources. Furthermore, you are more than likely creating a system that not only provides special access to content, but requires a financial requirement to provide said content. You now need to not only isolate your content, but provide an eCommerce solution to facilitate this access. Most businesses need fast solutions with a premium on speed to implementation. Not to mention implementing a system like this would require a web developer to implement, and costs soon become a real prohibitor to getting the system working. Fortunately, WordPress has time-tested tools to automate the scheduling, access conditions, and other complexities that can eliminate these challenges and allow for simple content publishing that doesn’t include complicated server scripting to accomplish. WooCommerce users have an affordable path to completing a system of this nature, with a selection of plugin extensions to speed up development. Using the immensely popular WooCommerce eCommerce system, coupled with the Subscription add on, a user-protected content system is far quicker to create than with manual user role protections, uses some very simple theme code to implement, and provides some back-end admin configuration pages to get going quickly. You’re halfway done! Since we want to create a gated site area with premium access, WooCommerce will be our tool for collection and managing payments of our users. If you need a primer on WooCommerce, please read some of our other posts to get you going. 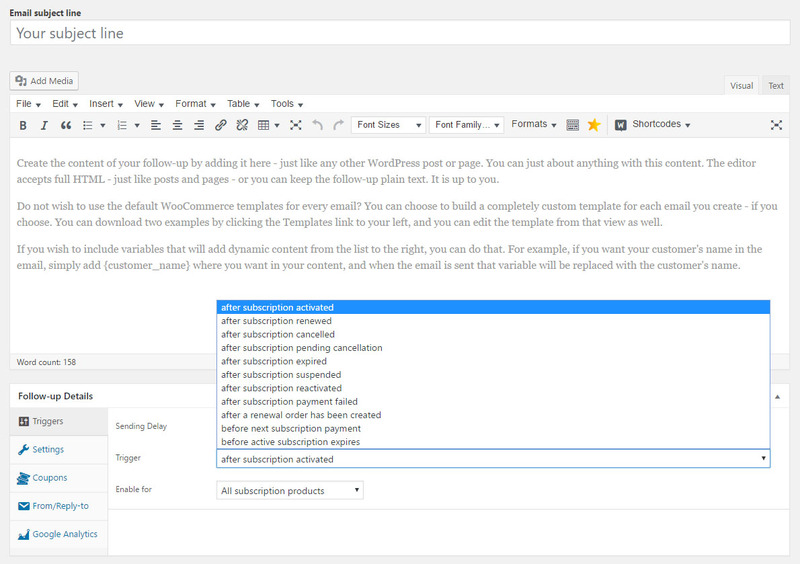 WooCommerce is of course free to use, but the Subscription plugin is a premium offering. It’s pretty affordable considering other alternatives, and with some basic configuration can more than likely provide everything you need for complex site access permissions. WooCommerce Subscriptions is a premium add on for WooCommerce and that will be the plugin that will complete our implementation. WooSubscriptions helps you create subscription products with recurring or one-time payments. This will give your users an easy way to sign up for your premium content areas, while also giving you an easy UI to manage subscription status in your WordPress User admin area. Your web developer can update your template files to check for this subscription. Reach out to our web team if you need some assistance with updating your theme files. With Subscriptions we can automate the user access. You can give your users different types of subscription models like weekly, monthly, and yearly access, one-time signup fees, free trials and expiration periods. You may want more control over the communication between your premium clients. Perhaps you would like to email alerts to users in danger of lapsing on a subscription of some new content or benefits they may miss out on. You can utilize Follow-Up Emails for better control of your alerts! Follow-Up emails will allow you to create emails that will be sent to your users on a variety of events. Some events include after subscription activation, after subscription expiry, and before the subscription lapses, you can send them an email a specific number of days in advance. This allows you to always keep a dialog with your user base going without too much manual effort. With this set of WooCommerce packages you can have a premium user experience setup very quickly, and your users will have the power to opt-in and opt-out at their convenience. Empowering your users to manage their own access levels will give them more ease of use with all of your offerings, and you can focus your efforts without dealing with user management minutia.